DLSAA President Nelson Arboleda Jr. and Executive Secretary Joaquin Moreno handed the donation to Dean Veronica Perez last Oct. 9, 2017 at the DLS-CSB SDEAS Office at Malate, Manila. SDEAS is a leader in learner-centered Deaf education and champions Filipino Deaf identity and culture through its academic offerings and formation programs by establishing partnerships between the Hearing and Deaf community. It highlights the importance of working with the Deaf rather than working for the Deaf. The donation for the Bahay Pag-asa Dasmarinas was received by its Director, Dr. Alrien Dausan and Ms. Nida Cruzada last Dec. 7, 2017at theDLSAA Office in Manila. Bahay Pag-asa Dasmariñas is a transformation center for children in conflict with the law. Instead of detaining them in detention centers, these children are cared for in a monastery-type center inside the 27-hectare campus of De La Salle University-Dasmariñas with the following objectives: 1) Administer a holistic formation program for children in conflict with the law; 2) Provide competent and committed legal assistance; and 3) Implement a post-release program. JHIS-LS Br. President Inigo Riola, FSC accepted the donation last Dec. 19, 2017 which will be used to fund four full scholars in JHIS-LS for one school year. Jaime Hilario Integrated School-La Salle (JHIS-LS) is a Lasallian co-educational primary and secondary school located in Bagac, Bataan, in the Philippines. It was opened by the De La Salle Brothers in 2006 to cater to the farming and fishing community of the municipality. 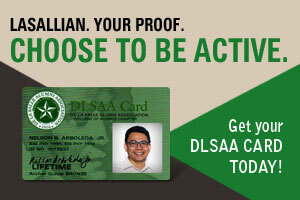 It is the 16th school of De La Salle Philippines, a network of Lasallian schools in the Philippines.